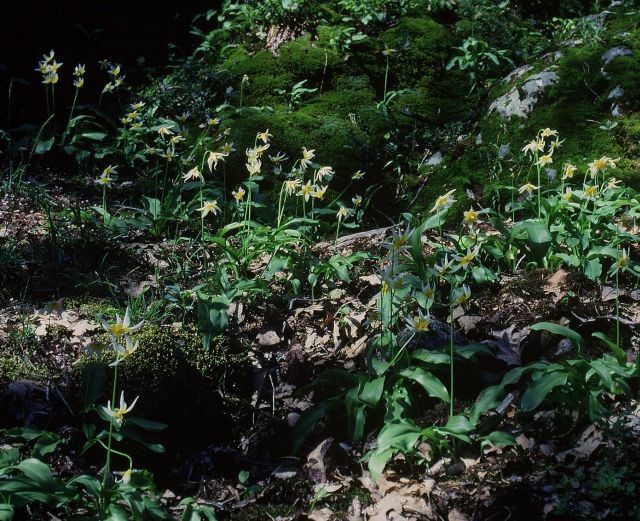 In the course of my travels from March through July 2005, I did not actually have time to visit wild populations of every single erythronium species in western North America. I prioritized my visits to populations of species that I had never seen before, so many of the species I did not visit in 2005 were ones that I had seen in previous years. As a way of putting the final touches on this series, and to make it as complete of an overview of western Erythroniums as possible, I've compiled this epilogue to describe my experiences of searching for additional taxa over the last 20+ years, other than in 2005. All of the taxa I will describe below Californian species, in fact, all are California endemics. Of the 14 Erythronium taxa known from the state of California, I've already covered in this series four endemics (E. californicum, E. helenae, E. multiscapoideum, and E. purpurascens), as well as five species that are found in other states as well as California (E. citrinum, E. grandiflorum var. pallidum, E. hendersonii, E. howellii, and E. klamathense). There are, however, additional five more taxa that are endemic to California, some that are well known, others that are more obscure, that I would like to describe in this installment. 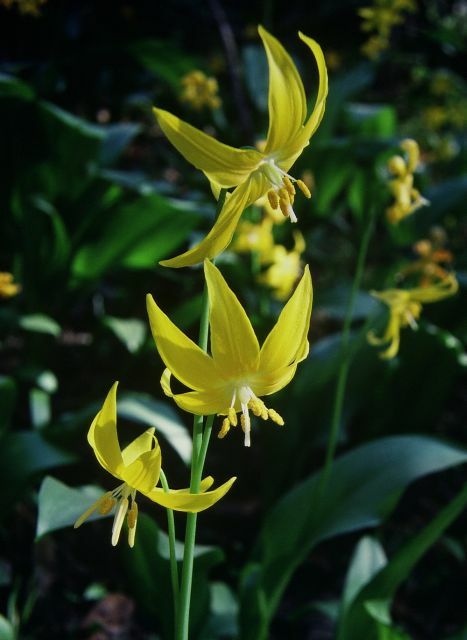 I will start with the plant that has been named Erythronium citrinum var. roderickii. This taxon was described in 1991 (Shevock and Allen, 1991), although it was known to its namesake, Wayne Roderick, as early as 1961. It is a local endemic of the upper Trinity River drainage in the eastern portion of the Trinity Mountains in NW California. This plant resembles typical E. citrinum in many ways, with mottled leaves and white tepals with a yellow band at the base. However, closer examination reveals several differences from typical E. citrinum. Most noticeable is the color of the un-dehisced anthers, which are purple instead of yellow as in typical E. citrinum. In addition, Shevock and Allen indicated that the yellow band at the base of the tepals is brighter than in typical E. citrinum. Also, some of the flowers take on a pinkish/lavender tinge as they age, and on some plants the styles have pinkish coloration. One plausible explanation for this combination of morphological characteristics could be that Erythronium citrinum var. roderickii is an allopolyploid species, having formed in the same manner as E. elegans. As you may recall from the May 2005 installment, a variety of data suggest that E. elegans arose from a hybrid between the white flowered E. montanum and the pink flowered E. revolutum. At some time in the past the hybrid doubled its chromosomes and the plants became a fully fertile species with four sets of chromosomes rather than the "normal" two sets. Possibly "var. roderickii" arose in like manner from a hybrid between E. citrinum and E. hendersonii. In their original description of E. citrinum var. roderickii, Shevock and Allen mention the possible influence of the lavender flowered E. hendersonii in the origin of E. citrinum var. roderickii; however, no other erythroniums seem grow within the limited range of E. citrinum var. roderickii, so the morphological features cannot be easily explained as a result of local primary hybrids. Primary hybrids in Erythronium are not uncommon where the geographic ranges of certain erythronium species overlap. Further complicating the picture is the fact that Dr. Allen, the second author of the paper describing E. citrinum var. roderickii, did not recognize this taxon in her more recent treatment of Erythronium for Flora of North America (Allen and Robertson, 2002) but instead placed it in synonymy under E. citrinum. This decision seems a bit opaque to me; having seen the plant in the wild, "var. citrinum" seems like a clearly distinct taxon, but perhaps Dr. Allen has additional data that have not been published that would support her placement of var. citrinum as a synonym of E. citrinum. If my allopolyploid hypotheses is validated by additional data (such as a chromosome count and molecular studies), E. citrinum var. 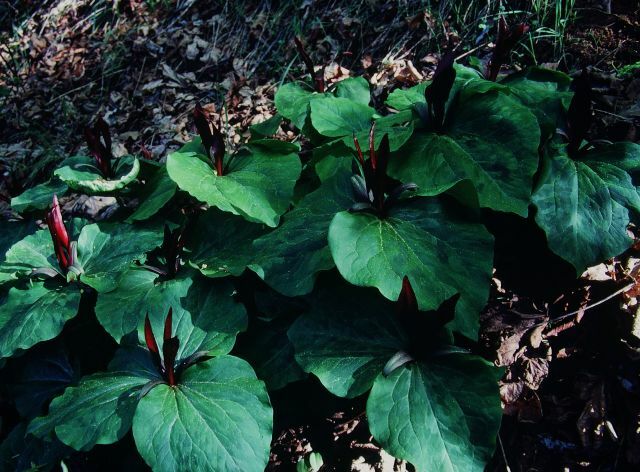 roderickii should actually be treated as a full species, Erythronium roderickii. But this name has not been validly published so it can not be used, even in the horticultural literature, until it is validly published. Erythronium citrinum var. roderickii grows primarily, if not entirely, in soils derived from ultramafic bedrock (serpentine and its igneous relatives such as peridotite), which are high in magnesium and heavy metals and low in calcium content. Such soils are so unbalanced that many plants are not able to grow on them. Although a number of other Erythronium species also occur on serpentine (including typical E. citrinum and E. hendersonii), E. citrinum var. roderickii may be the only Erythronium that is a true serpentine endemic. 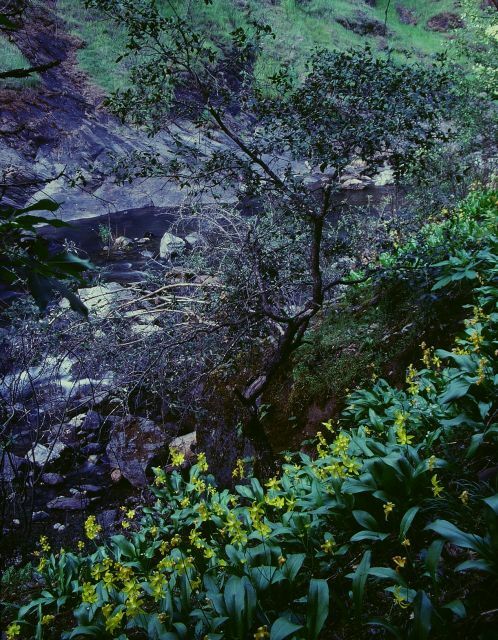 These photographs were taken on May 8, 1999, when I visited the upper Trinity River drainage, in the Shasta-Trinity National Forest, to search for this plant. My timing was perfect; because it grows at elevations of 3000 to 4000 ft. (about 900 to 1200 m.) its flowering season is somewhat delayed past the season of its lowland relatives. I found the plants mostly growing as scattered individuals in the understory of rather open conifer forest of Douglas-fir, incense-cedar, Jeffery pine, and California black oak. On the whole the plants were rather small, although this may be the result of suboptimal growing conditions rather than an inherent genetic trait. I would think this plant would grow well in gardens where E. citrinum and E. hendersonii are successful. However, it is such a local plant that bulbs should never be dug to transplant into the garden. I was fortunate to have met Wayne Roderick, the dean of California's native bulbs, in 1983. I attended the NARGS Winter Study Weekend that year, which was held in Port Townsend, Washington. Since Wayne was driving up from California he offered to pick me up at my home in Olympia and give me a ride to the meeting in his old van . It was interesting talking to him about his favorite spots in California, and it gave me a much better perspective when I was later able to visit the Tilden Park Botanical Garden in Berkeley, where he worked for many years. 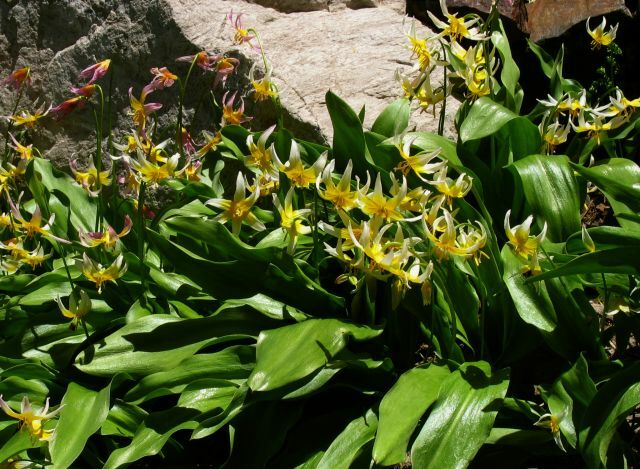 California's Sierra Nevada Mountains support six Erythronium species, many of which are very local endemics. In previous installments, I described two species that I visited in 2005, E. purpurascens and E. multiscapoideum. 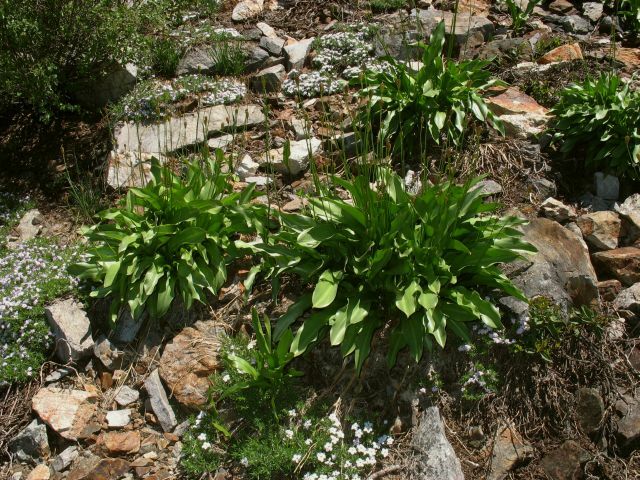 The Erythronium flora of the Sierra Nevada has been detailed in several papers by Jim Shevock and several co-authors (Shevock et al. 1990, Shevock and Allen, 1997). Here is a map, taken from the 1990 Shevock et al. paper, which shows the distribution of each species. I have updated the map by adding a red dot to show the location of the most recently described species, E. taylori. 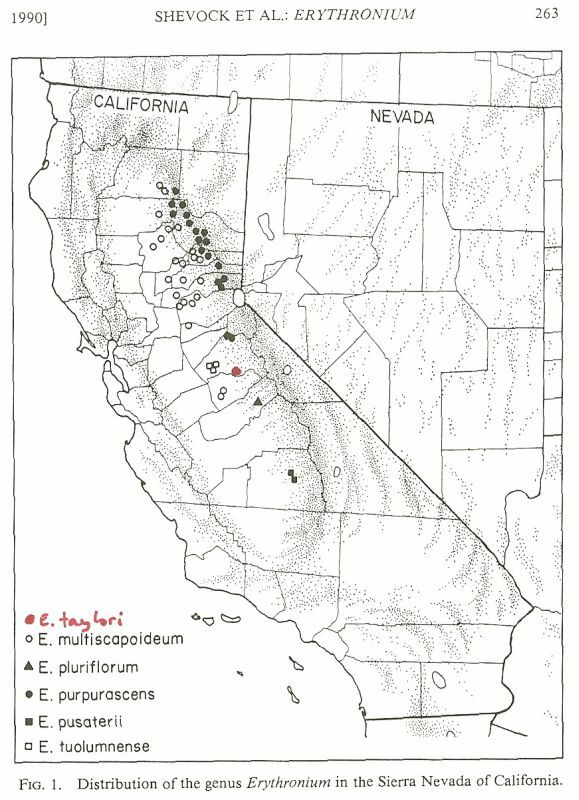 Distribution of the genus Erythronium in the Sierra Nevada of California, adapted from Shevock et al. 1990. Erythronium multiscapoideum is the only Sierra Nevada species with mottled leaves. In my April installment I described my visit to the locality along the Feather River east of Chico where it grows on serpentine rocks. This form, which is well established in gardens, has been called the "Pulga form" or has been known by the herbarium name (not properly published) "Erythronium cliftonii". This form is well established in cultivation and because it is so floriferous, it is clearly the more garden-worthy form of the species. I thought I should also include a description of the typical forest or woodland form, which I observed in 1985. One interesting feature of the typical form of E. multiscapoideum is that it produces new plants from stolons that creep out from the main corm, thus forming extensive colonies of single-leaved plants by vegetative means. In this habit it resembles species from Eastern North America such as E. americanum and E. albidum. Since I haven't grown the serpentine form myself I can't say whether it does the same, but where it grows in the wild, the serpentine form appears to increase more by offsets (forming clumps) than by spreading stolons. People who grow this form in their gardens may be able to clarify this distinction. Here is a photograph of a colony of E. multiscapoideum that I found on April 9th, 1985, near Georgetown in Eldorado County, California, where it was growing in a shady, sun-flecked understory of a bigleaf maple-California black oak forest. Among the thousands of single-leaved plants growing in soil rich in leaf mold, there was just this single flowering plant. Note that there is a bud on a second emerging flower stem, which clearly places this plant as E. multiscapoideum. Until recently there was a lingering question with E. multiscapoideum - was it actually closely related to the stolon-producing species of eastern North America, or was this a morphological trait that has arisen separately in two geographically separate lineages? The genetic data from Allen et al. (2003) strongly suggest that the latter is the likely scenario, and that E. multiscapoideum is actually most closely related to the non-stoloniferous E. californicum. Also growing in the same site with E. multiscapoideum was this beautiful trillium, T. angustipetalum. This is the only time I have ever seen this Trillium in the wild, and what I remember, more than its appearance, captured in this photograph, was the spicy scent of its flowers. Recall from the third installment of this series that the five Sierra Nevada Erythronium species with plain leaves (all but E. multiscapoideum) form a closely related (monophyletic) species group. Even though they exhibit a diversity of flower colors and sizes, these five species are believed to have evolved from a single common ancestor. 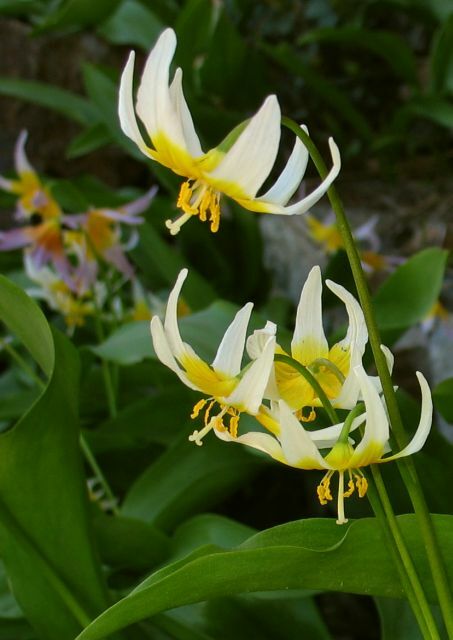 Erythronium tuolumnense is one of the most familiar of the Sierra Nevada species in gardens, primarily because of its prolific vegetative increase from offsets, which has made it easy for nurseries to sell at low cost. It is also a showy plant with large yellow flowers. 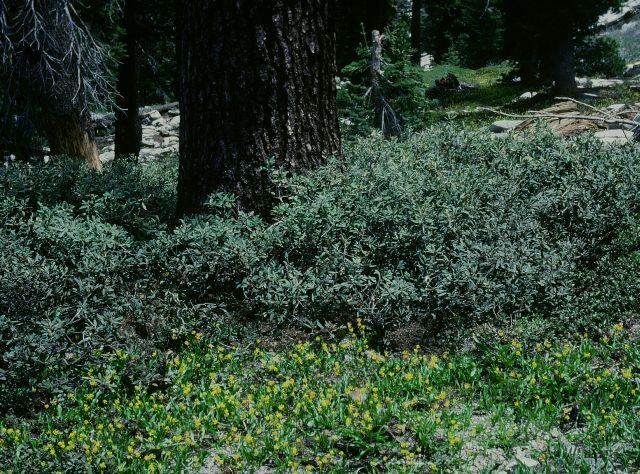 In the wild, however, it is a very local endemic of Tuolumne County, in the foothills of the Sierra Nevada, and it was only in 1930 when Elmer Applegate described it as a new species. I visited the type locality, Italian Bar on the South Fork of the Stanislaus River, on April 7, 1985. This is "Gold Rush" country, an all around are signs of mining activity that took place during the California gold rush in the mid-1800's, now abandoned and covered with vegetative regrowth. 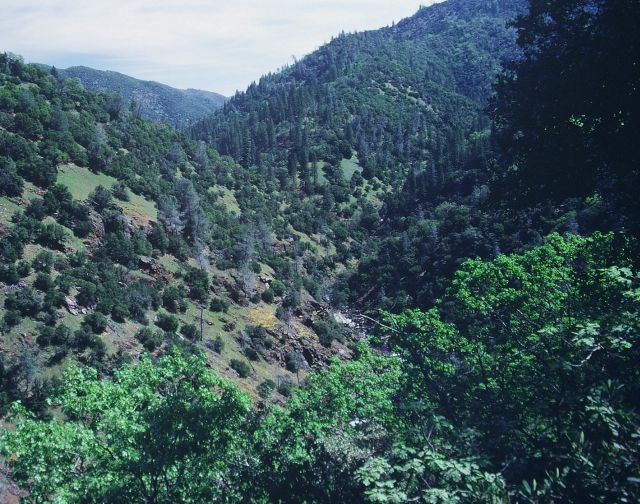 A view up the river shows the vegetation typical of this low elevation (1700 ft./ 500 m.) river canyon, with chaparral on the sunny, south facing slopes and mixed conifer-hardwood forest on the north facing slopes. It is truly a remarkable experience to travel hundreds of miles to a specific place where you hope to find a rare endemic in flower. It is almost a surprise when you round a bend in the road, and all of a sudden, there it is, miraculously, just like it was supposed to be! One might say that this is still gold rush country, only the treasure is a different kind of gold. My visit was perhaps a week after the peak of bloom, but there were still plenty of flowers in prime condition, covering large swaths of ground on north-facing slopes just above the river. However, the colony was very limited, and ended at a point only about 800 ft. (250 m.) down the road. I wondered why this would be the case. Is it because this species relies primarily on vegetative reproduction from offsets to maintain its colonies, and is apparently less successful at producing seed in the wild, that it has not been able to disperse away from this favored habitat? Apparently the type locality is at the lower elevational limit for E. tuolumnense, which extends as high as 3800 ft. (1160 m.). All of the known populations occur within a distance of about 15 miles (25 km.). Interestingly, Shevock et al. hypothesize that E. tuolumnense is now confined to local "cold air drainage microhabitats", which explains its presence at such low elevations, and may also restrict its ability to expand beyond its current localized geographic distribution. I have noted Ian Young's comments about the value of obtaining different forms of E. tuolumnense, especially seed-grown forms, for garden use. The two forms that I have been able to obtain from commercial sources have been rather disappointing, especially compared to the wild plants I saw in 1985. I can only surmise that the forms that are commercially available have been selected more for ease of vegetative increase, rather than floriferousness or flower form. While the story of E. tuolumnense is remarkable, in and of itself, the story of Erythronium taylori is even more amazing. You only need to go about 30 miles ( as the bird flies) to the southeast of the type locality for E. tuolumnense to get to the type locality of E. taylori. When I visited Italian Bar in 1985, E. taylori had not been discovered, let alone described; it was only found for the first time in 1996, and its description was published in 1997 (Shevock and Allen 1997). Even more amazing is that E. taylori grows only a couple of miles from the main highway to Yosemite National Park. How could it be that this distinctive flower could go unrecognized for so long? The story of its discovery begins with Dean Taylor, intrepid field botanist who has played a role in many of the amazing botanical discoveries in California in the last 30 years. For example, he was co-discoverer, with Glen Clifton (erstwhile namesake of "Erythronium cliftonii"), of the rosaceous shrub, Neviusia cliftonii. In April 1996, Dr. Taylor was exploring an interesting looking outcrop of metamorphic rock along Pilot Ridge in southern Tuolumne County. 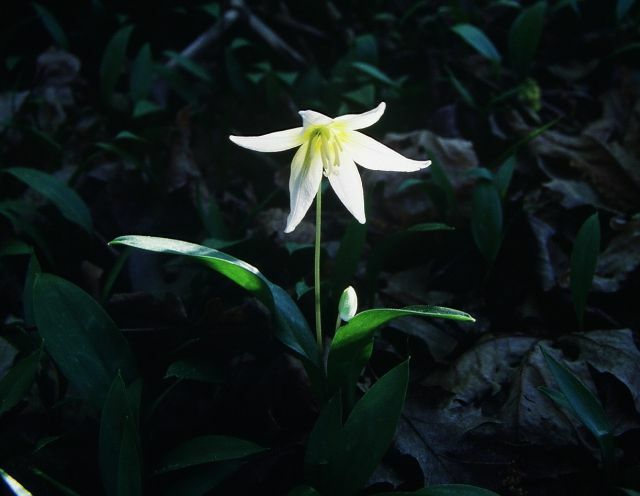 Although there are no trails accessing this area, he just "happened" to be at the right place, at the right time, to find an unusual Erythronium, which he did not recognize, in full flower. When I read the description of E. taylori in the journal Madrono, I knew that I had to see it in the wild, but it wasn't until May 1999 that I was able to make the trip. The plants grow at an elevation of 4400 to 4600 ft. (1340 to 1400 m), so their flowering is slightly delayed as compared to low elevation species such as E. tuolumnense. 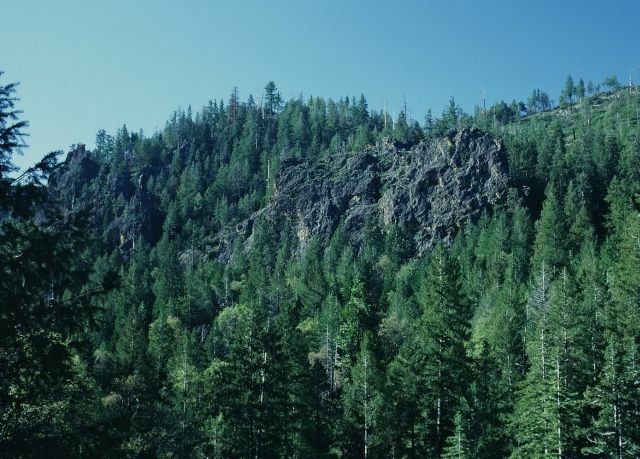 The habitat of this species is on north-facing slopes in proximity to large rock outcrops along Pilot Ridge. 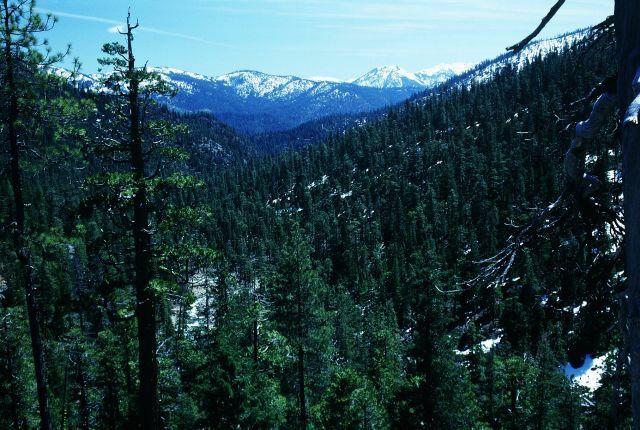 The surrounding forest here is a mixture of conifers, especially ponderosa pine, and hardwoods such as California black oak. 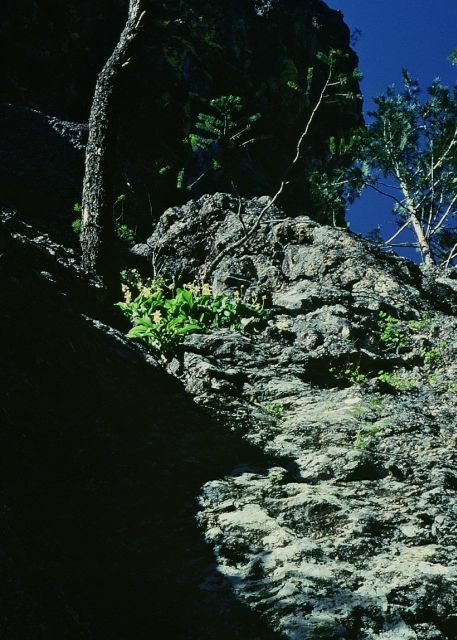 Erythronium taylori is very much at home growing in crevices and ledges of vertical cliffs, high out of reach. The bedrock here is apparently metamorphic rock of marine origin. It is possible that E. taylori is restricted in the wild to exposures of this certain type of bedrock, which could explain the very limited geographic distribution. Fortunately, Erythronium taylori also grows on ledges at the base of the cliffs, so I was able to see and photograph it up close. You can see in this photo a bit of the "clumping" of plants that is produced by its ability to form vegetative offsets from existing corms. This ability to increase vegetatively is a character that E. taylori shares with E. tuolumnense. Erythronium taylori is similar in size to E. tuolumnense, and like E. tuolumnense, the leaves are un-mottled, and healthy plants typically produce 2 to 4 flowers on a stem. However, the flower color is strikingly different, with white tepals that are yellow at the base, forming a large yellow center. The anthers are cream colored but the anther filaments are a darker yellow color. Also, inner three tepals each have sac-like folds or appendages at the base. Seeds of this species have been made available to growers, and Ian Young has featured his flowering plants in his bulb log in 2005 and 2006. I'm not sure, however, if visitors to his bulb log have really appreciated how remarkable the story of Erythronium taylori truly is. 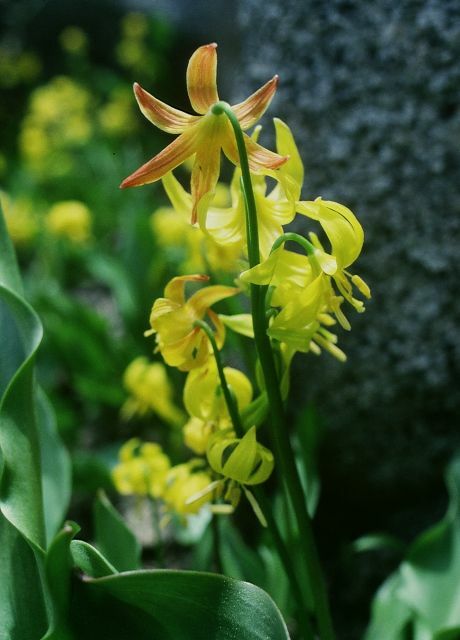 Given its native habitats, there is a good chance that this is a species that will grow well in typical garden conditions where other erythroniums are successful. I just hope that demand for garden specimens can be met by seed produced from plants already in cultivation, rather than deplete the limited population of wild plants. In this regard, exchanges of garden produced seed can be a valuable tool for conservation. My personal opinion is that E. taylori species will prove to be even more valuable as a future parent of hybrid Erythroniums which are an even better focus of general horticultural demand. Think of what could be produced by crossing E. taylori with E. purpurascens, E. klamathense, or even E. idahoense: A vigorous garden plant, increasing from offsets, and producing numerous yellow-centered white flowers, but with the grace and charm of the wild species. Yet, the wonders do not stop here. Another recently described local endemic, found only in Madera County (50 mi./ 75 km. to the south), is Erythronium pluriflorum. From the summit of Shuteye Peak, elev. 8350 ft. (2545 m.), one can view Chiquito Ridge running to the north for about 10 miles, and the entirety of the range of E. pluriflorum. 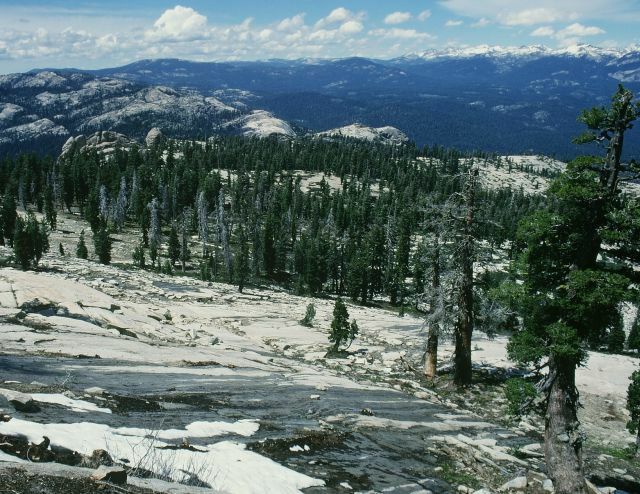 Like many places in the Sierra Nevada, this is a landscape of dramatic granite domes. 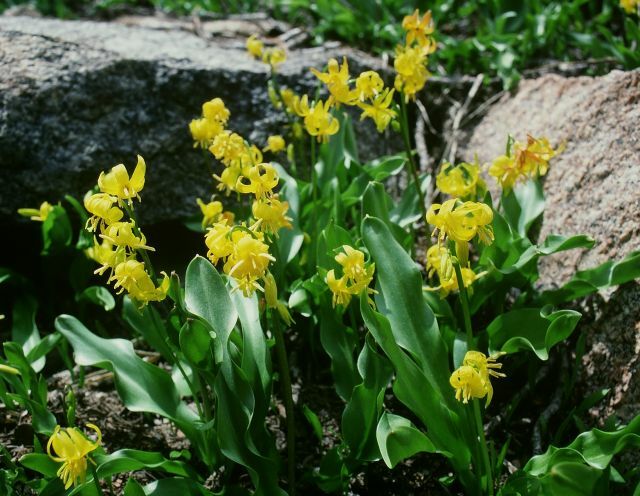 As the winter snows melt (in this case, on May 31, 1997), the granite ledges and understory of the open subalpine forest on Shuteye Peak are carpeted with millions of tiny yellow flowers of Erythronium pluriflorum. The epithet "pluriflorum" (many-flowered) is most appropriate, as this species typically has 3 to 6 tiny yellow flowers, but commonly up to 10 flowers on a single flower stalk. The tepals are typically only about ¾ in. (2 cm.) long. 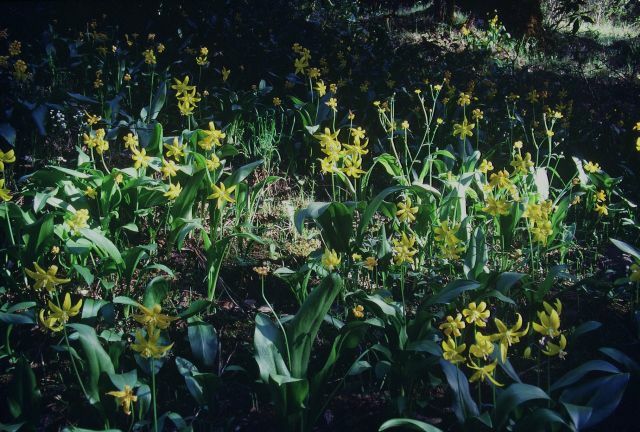 The effect, compared to a larger flowered species such as E. tuolumnense, is analogous to the contrast between Narcissus jonquilla (with its many small flowers) and Narcissus pseudonarcissus (with its few, large flowers). Erythronium pluriflorum is, in many ways, a yellow flowered version of E. purpurascens, however, the range of E. purpurascens does not extend this far south. Not only does E. pluriflorum have numerous small flowers on each stalk, but (like E. purpurascens) the inner three tepals lack appendages, in contrast with the other yellow-flowered Erythronium of the Sierra Nevada, E. tuolumnense. The tepals are highly reflexed into a "turk's cap" shaped flower. 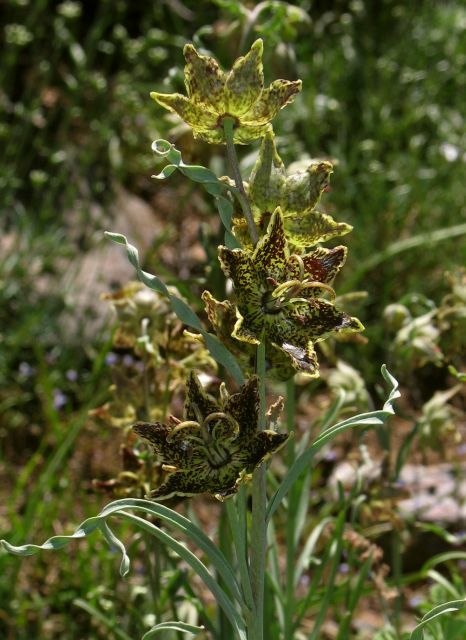 Also note the wavy-margined leaves, a feature of many of the Sierra Nevada erythroniums. One unique feature of E. pluriflorum is the color of the tepals as the flowers age. Unlike E. purpurascens, and other white-flowered species, which age to pink or purple, the flowers of E. pluriflorum age to an orangy-red color. Another noteworthy feature is the production of a second "flush" of flowers on the more vigorous plants, which emerge as the first flush of flowers of the first stem pass anthesis and begin to develop seed capsules. As a result, the most vigorous plants can produce up to 21 flowers on a single stalk! Specimens of Erythronium pluriflorum were first collected in 1907, but it went unrecognized as a distinct species (even by Applegate) until the 1980's, and it was formally described by Shevock et al. in 1990. This is a very local endemic, and the entire known distribution is only 7 miles (11 km. ), but the plants are locally very abundant. The primary threat to this species would seem to be global climate change, which could result in the current habitat being unsuitable, and leaving it with no opportunity to migrate to higher elevations. Since this is a subalpine species which grows in habitats that are covered with a deep snowpack until late spring or early summer, E. pluriflorum is likely to be difficult to grow in typical garden conditions, though I have no personal experience with this plant to speak from. However, if it could be grown, it could be a valuable parent for producing unusual, multiflowered garden hybrids with other yellow species such as E. grandiflorum. All in all, E. pluriflorum is a unique and appealing plant, and I consider myself fortunate to have been able to see it. Here is a nice composition with E. pluriflorum forming carpets in the foreground and also in the distance, accompanied by a nice shrubby evergreen oak. The final entry of the five Sierra Nevada erythroniums, Erythronium pusaterii, is the one that eluded me for the longest time. It wasn't until this year (2006) that I was finally able to see it in flower. Erythronium pusaterii is yet another local endemic of the subalpine zone of the southern Sierra Nevada mountains. 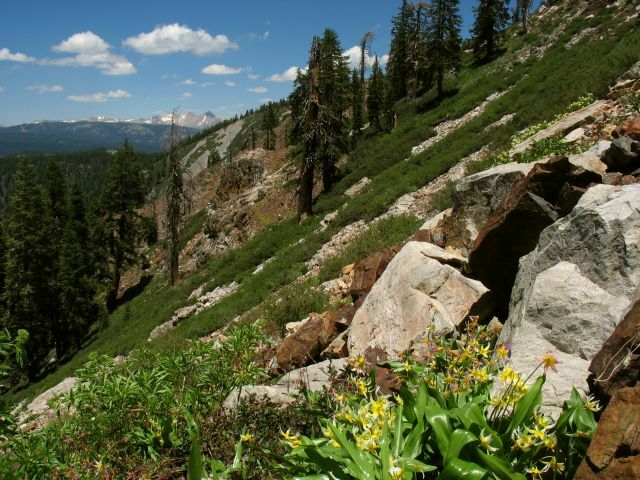 It is only found in four localities in roadless areas of Sequoia National Park and Giant Sequoia National Monument. To see it, one must hike. My first attempt, in mid-June 1998, was foiled by an unusually deep and late melting snowpack which obscured the trail and prevented me from reaching my destination, which on that trip was the type locality at Hockett Lakes. This year (2006) was also a deep snowpack year so I hedged my bets and waited until the very end of June to time my visit. 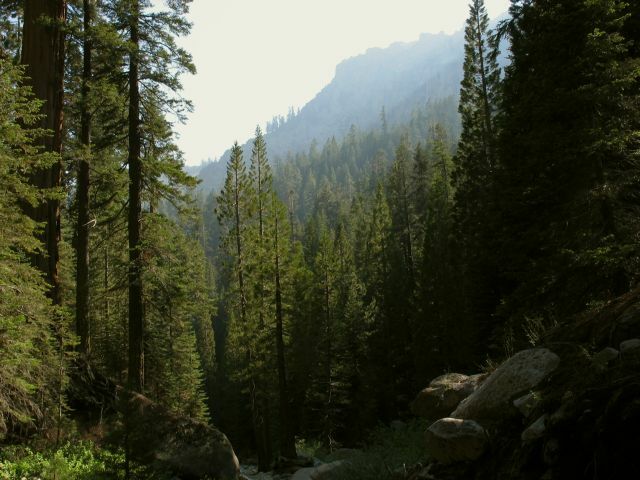 My first stop, on June 30th, was the trail up the North Fork of the Middle Fork of the Tule River to Moses Mountain, where the population of E. pusaterii reportedly consists of several million plants. But when I reached the base of Moses Mountain, I realized that I was actually late in the season, and if I was going to find Erythronium pusaterii plants in flower I would have to climb, off trail, over 2300 vertical ft. (700 m.) to the top of Moses Mountain, which is over 9300 ft. (2830 m.). I happened to meet a climber who had just returned from the summit, and he commented on how difficult a climb it was, especially because of having to bushwhack through brush fields. From this pleasant spot in the giant sequoia forest, I figured there must be an easier way. Fortunately, there was another option, Jordan Peak, which is about 4 air miles SE of Moses Mountain. The summit of Jordan Peak is nearly as high as Moses Mountain, (9115 ft. / 2780 m.), but is easily reached by hiking a ½ mile trail from the end of an old logging road. Much easier than climbing Moses Mountain! 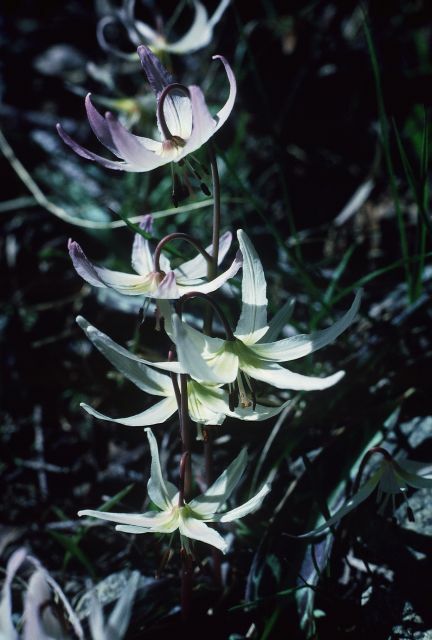 Once I reached the summit of Jordan Peak the next day (July 1, 2006), I noticed that the snow was nearly all melted and quickly realized that I was actually several weeks past the time when erythroniums had been in full flower. Would I be skunked again? Fortunately, the answer was no, and after a half hour scrambling on the talus on the north side of the summit, I found a sheltered spot where the snow had lingered later into the summer than elsewhere. Finally, the elusive Erythronium pusaterii had been found! Erythronium pusaterii is yet another species with large white flowers prominent yellow centers. Erythronium pusaterii was described in 1964 as a variety of E. grandiflorum. It really has little in common with E. grandiflorum (other than the plain leaves and tepals with appendages), so it was elevated to full species status by Shevock et al. in 1990. It is perhaps closest to Erythronium taylori, but the yellow "egg yolk" in the center of the flowers is even larger. The most obvious difference is that E. pusaterii has yellow anthers and white filaments, in contrast to the cream anthers and yellow filaments of E. taylori. The stigmas of E. pusaterii are more likely to have short lobes. Like many other species, the flowers of E. pusaterii fade to pink. Ecologically these two species are very different, with E. pusaterii occurring in subalpine habitats, and E. taylori a lower montane species. Geographically, E. pusaterii is separated from E. taylori by about 120 miles (195 km.). E. pusaterii is also a local endemic; the distance between the northern and southern-most of the four known populations is only about 17 miles (28 km). In optimal habitats, E. pusaterii is extremely prolific, forming large clumps of leaves, presumably from vegetative offsets. One might even say it is a bit "cabbagey" in appearance. It is odd to think that this species can grow so vigorously, and yet be so restricted in its distribution. Why has it not spread more widely? A most remarkable feature of Erythronium pusaterii is the extreme elongation of leaves and fruiting stalks after anthesis. While it is typical for Erythroniums to elongate their stalks after flowering, E. pusaterii takes this to another level. On one part of the hillside, individual clumps were up to 30" tall, with dozens of fruiting stalks arising above clumps equally as wide. Presumably each clump is a single plant, having increased vegetatively from offsets. 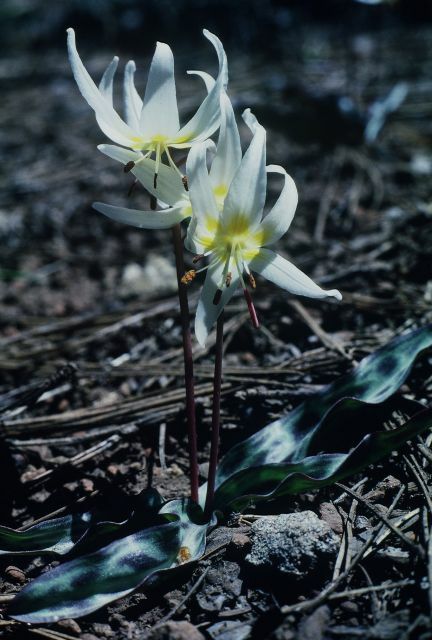 Being a plant of the subalpine zone, Erythronium pusaterii is unlikely to be an easy plant to grow in typical garden conditions. While it is a nice plant, I frankly don't think it would be a choice garden species, even if it could be grown - the volume of leaves to flowers is a bit excessive, and the flowers themselves don't seem to have the grace and charm of some of the other species (not that I would ever say anything bad about an erythronium!) So perhaps it is just as well that is such a rare endemic, something to be south by the connoisseur who is willing to travel to the far ends of the earth (or at least the far ends of California) to be in its presence. Also on Jordan Peak, there were plenty of interesting subalpine rock garden plants growing with Erythronium pusaterii, including abundant phlox and penstemon in bloom. In one area there was a nice colony of a Fritillaria (F. pinetorum?) which I thought I would include for Ian Young's sake. Speaking of Ian, I wanted to thank him for his assistance and encouragement over the past five months as I have been putting my notes and photos together to create this series. It has been a fun project. 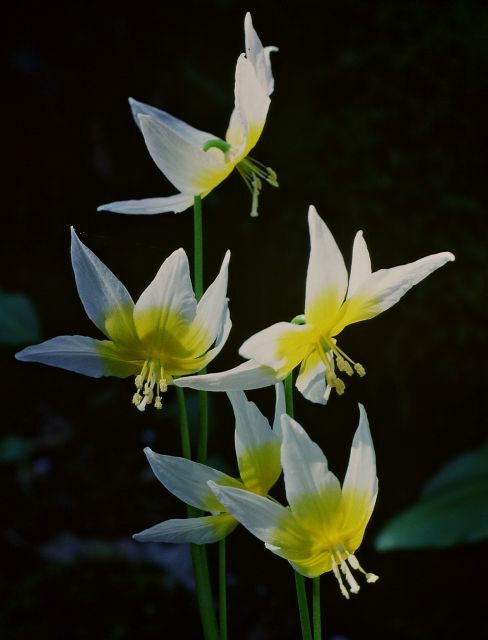 On July 1, 2006, sitting below the summit of Jordan Peak, on a warm sunny day with Erythronium pusaterii flowering at my feet, Ifelt a sense of accomplishment, having achieved a certain sense of completion in my quest for western erythroniums. Allen, G.A. and K.R. Robertson. 2002. Erythronium. Pp. 153-164 in Flora of North America North of Mexico, vol. 26, Magnoliophyta: Liliales and Orchidales. Oxford University Press, New York and Oxford. Shevock, J.R., J.A. Bartel, and G.A. Allen. 1990. 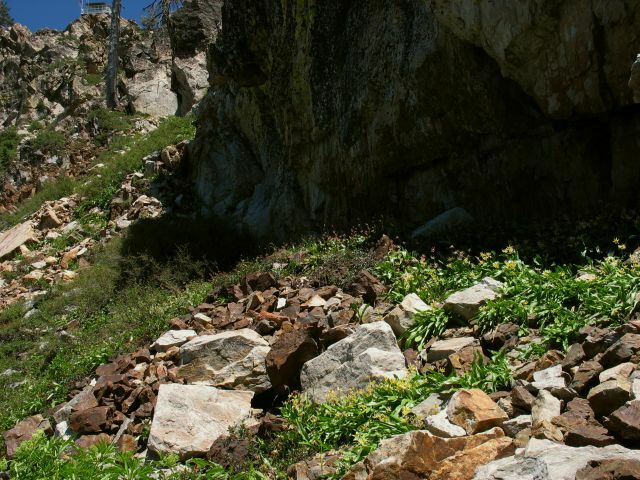 Distribution, Ecology, and taxonomy of Erythronium (Liliaceae) in the Sierra Nevada of California. Madrono 37(4):261-273. Shevock, J.R. and G.A. Allen. 1991. A new variety of Erythronium citrinum (Liliaceae) from the Scott Mountains of northwest California. Phytologia 71(2):101-103. Shevock, J.R. and G.A. Allen. 1997. Erythronium taylori (Liliaceae), a new species from the central Sierra Nevada of California. Madrono 44(4):359-363.